These examples are all in Dropped-D tuning. For those of you unfamiliar with this tuning, it is similar to normal tuning, except that the low E-string (6th string – the fattest one) is tuned to D (one whole step down). If you have a common chromatic electronic tuner, you can accomplish this pretty easily. 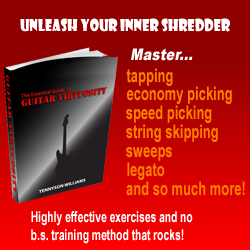 So let’s take a look at what I like to refer to as dropped-D power chord scales – essentially a map of the power chords in the key of D. By using these chords together you can easily create your own great-sounding riffs and songs. Example Two applies the same basic idea from above to the chords on the 5h string. Again – the results sound awesome! In the next example I play a different three-note riff – two fretted notes followed by a palm muted open (D) power chord. Note how the open chord occurs at different places from one measure to the next. Cool? Yes! ©2010 Paul Tauterouff All Rights Reserved. 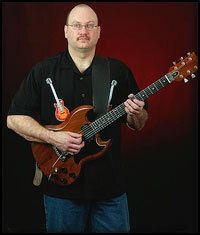 About The Author: Paul Tauterouff is a professional musician/ guitar teacher in New York. For more information visit Paul’s website at http://paultauterouff.com.